DEAR TIM: I love my plumber but I am getting sick and tired of paying him to unclog my drains. Do all household drain lines clog? DEAR SANDY: Calling a plumber or a drain cleaning company each time you get a clog can indeed be expensive. But keep in mind that some plumbers and drain cleaning companies offer a limited warranty on their work. If a drain stops up again within a specific time period, you do not have to pay to have them come back out. Get this warranty in writing if you do find that you need professional help in the future. CLICK HERE to get FREE & FAST BIDS from local drain clearing companies and plumbers. Be SURE to ask them about their written warranties! Every drain line in every house is susceptible to clogging. Certain drain-pipe materials, plumbing codes and excellent plumbing practices can keep clogs to a minimum, but few homeowners ever have the opportunity to specify the piping material and possess the knowledge to determine if a plumbing drainage system has been installed to the highest levels of workmanship. PVC plastic and copper drain lines have very smooth interior surfaces. These are least likely to clog. But they can and do clog! Not too long ago I had to clear a clog in my own home. The building drain pipe under my basement floor is PVC. The source of the clog was a new low-flush toilet. I'm not a fan of these. This particular toilet only sends two quarts of water down the drain if you flip the flush handle. To get the entire 1.6 gallons of water out of the toilet tank, you have to hold down the flush handle for five seconds. That's a very poor design because the average homeowner would never know to do that, nor want to stand there holding down the flush handle. My son and wife were not doing that and about thirty feet away from the toilet, a giant buildup of toilet paper clogged the drain. It took a while, about one year, for the drain line to completely get clogged with a mass of toilet paper and other solid you-know-what. I was able to get it cleared with ease using a 50-foot hand-powered drain cleaning snake. Once I put the snake in the clean out opening I had the clog removed in about ten seconds. Here's the exact simple drain cleaning snake I used to clear my clog. CLICK THE IMAGE NOW TO HAVE THIS DELIVERED TO YOUR HOME. Older homes often have drain pipes made with galvanized or cast iron pipe. Smaller diameter drain lines made with these materials are prone to blockages. 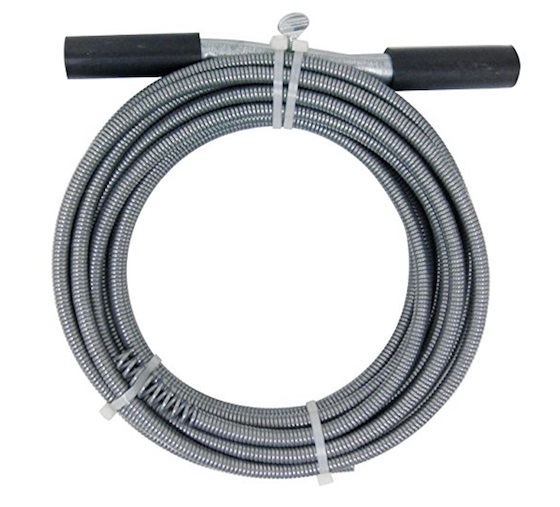 The galvanized and cast iron drain lines over time begin to corrode from the inside out. A scale of rust and corrosion creates a very rough inner surface that helps to grab hair, toothpaste, soap film, etc. Soon the inner diameter of the drain pipes begins to get smaller. I have seen some 1.5 inch inner diameter drain lines packed solid with rust, scale and black organic goop and biofilm. Many common toilet clogs can be removed with just a five-gallon bucket of water. Some clogs in toilets allow water to slowly get past the clog. You'll flush the toilet, the water will rise to the top of the bowl and either overflow - a HUGE MESS - or it will stop just in time. Then ten minutes later you'll notice the water level in the bowl has magically dropped to the normal level. But don't be fooled, the clog could still be there because the water seeps past the toilet paper in the clog. Ninety percent of the time if you have a clog like this, you can free it with five gallons of water. Fill a bucket and hold it up about 18 inches from the toilet bowl. Pour it as FAST AS POSSIBLE into the bowl and stop pouring just as the water rises to the rim of the bowl. The weight of the water falling that distance and lots of it at once put lots of pressure against the clog. In almost all cases, it's enough to unclog the toilet. No need for the messy plunger! Plungers do work very well if you use them properly. They should be the first tool one uses when a clog happens. It's important that the bottom of the plunger make full contact with the fixture so the pressure you create when plunging is forced down the pipe. If the plunger seal is inadequate all the pressure will just be in the sink or toilet and wasted. When you are working on a tub or bathroom sink drain, you tend to get the best results if you remove the stopper mechanism from the drain inlet. To remove a sink stopper, you must remove the control rod that connects to the stopper and sticks out the back of the pipe that exits the bottom of the sink. Reinstall the control rod and nut into the pipe after the stopper has been pulled up from the sink. Tub drain stoppers typically are attached to the lever on the overflow outlet. Remove the two screws at this location and pull up to remove the lever and the tub stopper. Often hair and goop will be on the end of the control rod and the bottom of the stopper. This alone may be the source of the problem. If the drain is still clogged, take a wet wash rag and hold it over the drain overflow holes at the top front edge of the sink. Run water so that you have about two inches of water in the sink, hold the rag tightly against the overflow holes and push hard down on the plunger two or three times. Remove the plunger to see if the clog was dislodged. If you're lucky, you will experience instant improvement. Water will flow readily from the sink or tub. If plunging does no good, it may be time to try some of the off-the-shelf drain cleaners and/or call in a professional. You can prevent clogged drains by performing some very simple tasks on a routine basis. Check the sink and tub stoppers on a quarterly basis for hair and biofim buildup. It is easy to remove and replace these items. Once a week, fill each sink in your home to the brim and then pull up the stopper. The volume and weight of the water will fill the drain pipe completely with water. It will do a good job of flushing the drain line. Once a week pour five gallons of water as fast as possible into a toilet to give the drain line a great clean out. Once every three months fill every sink and tub in the house with water. With the help of friends or family members simultaneously pull all of the drain stoppers up and flush all toilets in the house. This large volume of water will help flush out the larger sized drain stacks and underground building drains. If your home is connected to a municipal sewage plant, you can really help your drain lines if you pour liquid chlorine bleach into the fixture traps once a month. Pour 12 ounces of bleach into each sink and tub before you go to bed. Pour it carefully into the drain of stainless steel kitchen sinks. Chlorine bleach that lays on stainless steel can cause permanent stains. The chlorine bleach that sits in the trap and saturates partially clogged drain lines works to soften biofilm and debris overnight. When you use the fixtures the next day, water running through the drain lines carries the debris to the sewer. 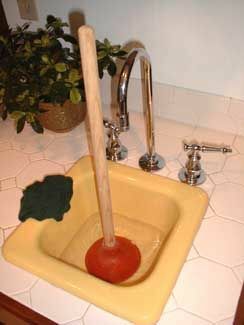 When using a plunger, the first action should be to create a suction action by strongly pulling up on the plunger in a filled basin, whereas initially pushing can create greater packing at the clog. You need my Deck Cleaning and Sealing ebook. Is it safe for the pipes (the trap, actually) to leave the bleach much longer than overnight? My brother likes to leave the bleach in for a week, and he says that leaving it in for only a day or two isn't nearly as effective. Also, is it possible that a clog beyond the trap can be reduced by the chlorine vapors that evaporate from the bleach in the trap? If so, perhaps that's why leaving it for a week is more effective. You can try it. If the chlorine bleach doesn't loosen the clog in 8 hours or so, you need a traditional snake or other drain-cleaning process. Bleach is the easy way out. It won't work on non-organic blockages, tree roots, etc. My mother's 40 year old drain pipes all seem to have a hard black buildup in them as they go into the wall. If the sink has not been used in a while I can kind of chisel it out with a screw driver after I remove the P trap, etc., but I suspect there is more further in the pipe. Any idea what this stuff is or what to do about it? Gunk. You can try to snake through it. If unsuccessful, then you install a new branch arm. I FELLOFFN YTHEroof dand btroke my hip swhile plugging the drain vent.the devive I used called Drain King used the pressureized loimebtom removeb grease clogs,etc. I was tired of using chemicals and Drano, and of course calling the plumber. Have you ever heard of Eco Drain System? It took about 60 days of using the product, but there are no more back ups in my shower and kitchen. Supposedly, it is a bacteria based natural cleaner. Not sure exactly how it works, but I don't have anymore odors either. Wanted to know if you ever tried it or heard of it? I've not used the product. You may want to re-read the column above and look at the chlorine bleach hack. I've had some decent success in my kitchen sink drain line using the foaming Draino product. It contains chlorine bleach. I really dislike bleach - my asthmatic lungs really object to it regardless of how careful I am. About once or twice a month I put equal amounts of baking soda and vinegar in my drains, let it sit for at least 20 minutes, then follow it with a large bolus of close-to-boiling water. As far as I can tell, this has been a successful strategy for many years. It never occurred to me to use it on the toilets, though I've never had a problem with them - do you think the soda-and-vinegar might be useful for maintenance of the toilet pipes? Or would just a bolus of hot water do the trick? I've got septic. Your solution is *useless*. The baking soda is alkaline and the vinegar is acidic. The two chemically react and make a NEUTRAL solution that is powerless. When I built my house 28 years ago I put in 4" main drain pipes to the septic tank and a 3" pipe from the washer and kitchen area to the 4" main. All PVC. Never a problem so far. I believe code specified 3" main and 2" from the kitchen. Overkill seems to have worked well. I hear what you're saying but I also hear this specific tip on a lot of different websites. Why do you think this misinformation continues to be passed around? I know my grandmother used this technique and swore by it. Strange! I think watching the process of the bubbling reaction causes one to believe it's really doing a job . . but the truth is it is creating a base product in the end that does nothing in regards to dissolving waste. It is possible that the hyperactive exchange of molecules can loosen some stuff in the initial process. I've watched a tutorial on Baking Soda & Vinegar, vs Hydrogen peroxide, vs Bleach . . bleach was the only household product that actually dissolved clumps of hair . . and that only took a matter of a few minutes. Anyone that has messed with their pipes has probably seen the crusty black buildup that spreads the entire area of a drain pipe. It'd be interesting to find out what would break this down . . other than snaking the line . . as I suspect that is the largest problem with slow drains . . that buildup of Gunk and Crust. That being said, I've read that bleach(Sodium Hypochlorite) is OK to pour in your lines to dissolve gunk and also that it is Bad to use as it corrodes metal pipes (safe on pvc btw) . . But Drano Max Gel contains bleach as 1/2 of the active ingredient, so should one never use Drano? Of course, if one is on a septic system . . that's a whole other ball game.